Now in 2019, after 30 years, we would like to share this update with everyone who visits our school, our websites, attends our courses, our customers and the horse owning community. In 1990, Western Horseman published “A Country Boys Vision.” That simple Track and Camera was the beginning of the School and the Farriers’ National Research Center, Inc. by 2001. Hi, my name is Link Casey, I am the son of Ralph Casey and was only 3 years old at the time of the article. Afterwards, I spent numerous years helping my dad with the research. I would like to share the “Vision” that became our reality over the last 29 years. We want the American public to know beyond a shadow of a doubt, there is a research center in the U.S. studying farrier science. We want the public to know just how dedicated we are to the farrier trade, the SAFETY of our horses and encourage more horse owner knowledge. We believe if the horse owner is better educated, the horse will not suffer needless pain and live a longer and healthier live. We, as farriers, understand that the hoof carries the entire weight of the horse. It is estimated by equine studies and resources, that more than 98% of all problems a horse will incur in a lifetime will be related to the lower limbs and hooves. What creates an unhealthy horses’ pain is primarily neglect of hoof care…and incorrect trimming and shoeing. We realized back in 1990 that to help farriers become better trained, owners would need to put the pressure on farriers to do a better job. The only way they can do this is to participate in the understanding of “where the farrier is going and how he is going there to accomplish his job.” Even the farrier certification programs need to be updated to offer a better understanding. “What is the primary reason for trimming and shoeing a horse?" Our Six Steps to explain this as is many of our teaching tools are copyright. I can guarantee owners that they will learn more here than in any other horse clinic out there. . . and SAVE their HORSES. . . from future suffering and pain ! The photos below help describe the equipment we designed that helped us uncover many new methods that could easily solve some of the simplest problems that owners and farriers make today. …in order to measure the heel depth, toe depth of the hoof as it strikes the ground and length of the stride. The Treadmill was added in 2000. While in one position, whether filming or just watching, the owner and the farrier in training, can witness how trickery devices on shoes will alter the motion of the horse and also by observing the conformation in motion. The Track as photographed and filmed from the hind view. Case Studies include shoe styles and what they “do” for the horse as it travels, short shoeing, trimming for barefoot riding vs shoeing, nails, traction, glue- on, plastic, steel, aluminum. Many of the estimated 2,000 styles of shoes on the market today. The Adjustable Shoe designed by Ralph was the very first of its kind and has not yet been duplicated. By applying our shoe, only once, the attachments can be applied one at a time, then re-evaluated on the track and treadmill in order to re-measure and film each reaction. This would further prove or disprove the theory behind many shoes and styles of yesteryear. Our small barn beginnings, now covers 10 acres. These four photos are part of a research project. We took a base wide horse and purposely shod it incorrectly to show that while in passing gait, we could actually “create speed-cutting” to make the horse fall. Magnetic Therapy was another way we could provide comfort and circulation for sore horses. We built a stand for a unit that provides pulsating magnetic waves up to 8 feet. The horse would literally back up under it. The Hydraulic Table was the most humane way to work on the horses that could NOT stand up for farrier work. 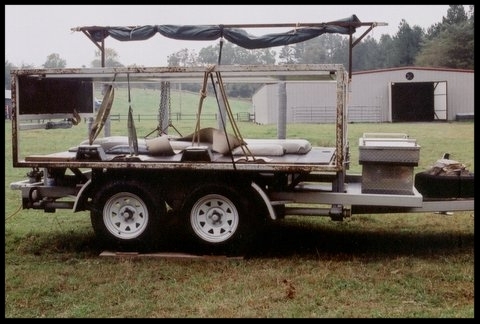 Designed and built by a farrier in Missouri. This Bio-Compression Unit was given to us for trial studies. It offers cool or warm heat from water providing circulation to the legs and hooves. (Very similar for human uses) It was tested here and one of the first introduced in the equine industry, right here at the FNRC. 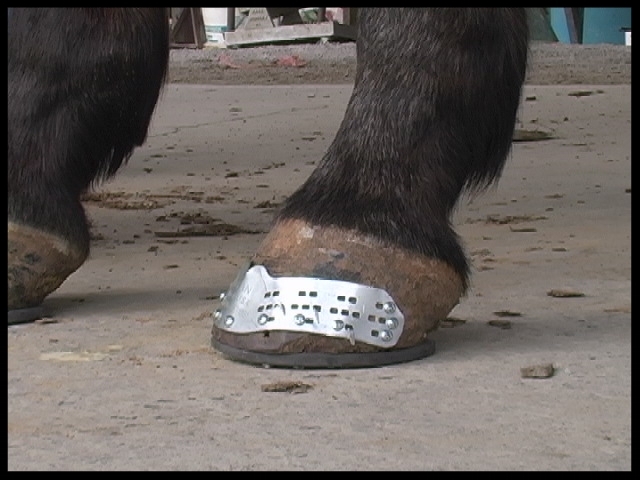 The Nolan Hoof Plate was proven to work right here at our facility. I stress, “when properly applied,” it helps ease the pain in problem hooves suffering from lameness issues known as laminitis. Working directly with the inventor, Mike Nolan, (currently deceased) we documented and filmed our cases while teaching farriers how to apply it. We shared our knowledge with the world on our Horseshoe’n Time TV show. We have incorporated a new way of teaching these new farriers more about the whole living horse with a technique developed by an FNRC Staff farrier member. Equine Flexion Therapy, EFT, is offered as an excellent tool for better overall understanding the muscles and tendons that relate to soreness to the entire body that will eventually affect the hooves and lower limbs. This is the best anatomy class that ANY Horse Professional, Rider and Farrier could be offered. Classes taught by the inventor who is a professional horseman, farrier and equine adjuster. Please note: We do not use cadaver hooves to shoe or trim.